If the last blog got you thinking about chocolate, here’s an easy recipe for making your own chocolate peppermint bark. It’s a great holiday gift. Feel free to improvise, and add nuts, coconut, dried fruit, whatever makes you smile. 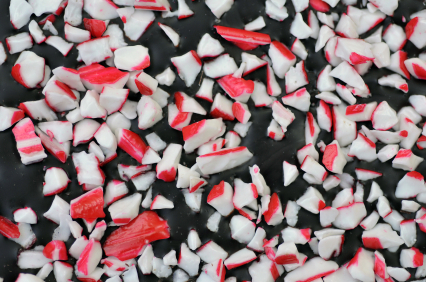 A small word of warning…the peppermint candies will scratch the work bowl of your food processor, and make an unbelievable noise. You could substitute milk or white chocolate for the dark, but why? Unwrap the candies and place them in the work bowl of a food processor fitted with a steel blade. Pulse until the candies are finely chopped, about 2 minutes. Place the chocolate in the top pan of a double boiler set over hot water. Stir often with a rubber spatula to help melt the chocolate evenly. While the chocolate is melting line a baking sheet with waxed or parchment paper (parchment paper works better). When the chocolate is thoroughly melted, stir in the chopped peppermint candies and mix well to coat them with chocolate. Pour the chocolate mixture onto the baking sheet and use a spatula to spread it to a thickness of about 1/4-inch. Chill the bark in the refrigerator until set, about 30 minutes. Remove the bark from the refrigerator and gently peel off the paper. Break the bark into 1-inch pieces. You can store the bark in an airtight container for up to a month in the refrigerator, but I bet it won’t last that long. Enjoy! Next post: How to Grow Your Own Oyster Mushrooms: a Locavore Diary.